Unfortunately, identity theft is a real problem in the United States. Although credit cards and banks can help you recover a portion of your accounts, they do not offer all of the services that identity theft protection agencies offer. 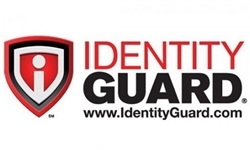 If you’re looking for a dependable identity theft company, consider Identity Guard. Our Identity Guard review shows they offer a wide variety of services, depending on which of their two plans you choose. They are also affordable as plans start at just $7.20/mo for individuals, but it’s important you assess all the features you might need since you only get what you pay for. Identity Guard offers customer support six days a week (Mon – Sat). $1 million worth of identity theft insurance is available with all their plans, which makes them stand out from their competitors. Like most identity protection agencies, Identity Guard monitors your financial information, as that’s where identity theft is most likely to occur. In an effort to keep your finances from being drained, Identity Guard monitors all three credit bureaus, in addition to any bank accounts, you may have in your name. Not only does Identity Guard keep an eye on your finances, they also make sure that your identity is secure. They regularly monitor your Social Security number and IDs, and they even make sure that your information isn’t being bought or sold on the black market. Identity Guard also monitors public records that could become a target for criminals. This includes birth and marriage certificates, as well as basic contact information, such as addresses and telephone numbers. Not only do they monitor this information, but they will also provide you with alerts and reports outlining the activity they have discovered. 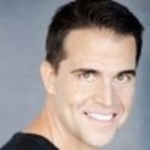 Identity Guard offers three clear and competitive plans that suit an individual’s needs. Other family plans are available as well. If you’re looking to save some money and you aren’t concerned about having the most comprehensive plan available, choose the VALUE plan. They still offer $1 million in identity theft insurance, in addition to monitoring your accounts and Social Security number. 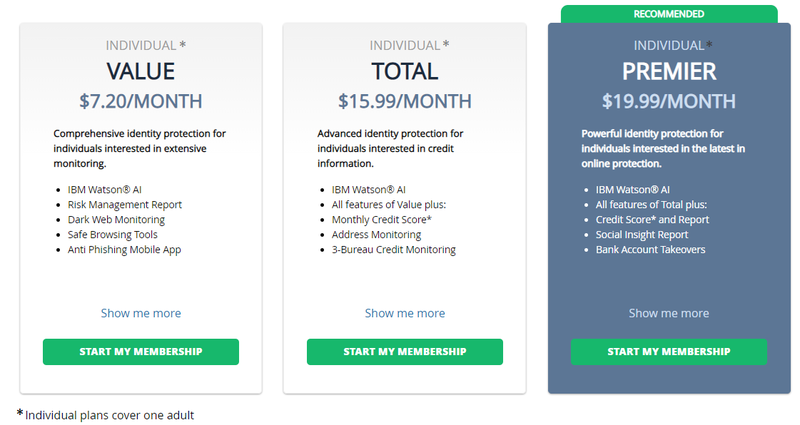 If you are interested in keeping an eye on your credit score with all three credit bureaus, in addition to protecting your computer, choose the PREMIER plan. All plans include IBM Watson® Artificial Intelligence, which monitors and processes billions of pieces of information to alert you about threats to your identity. Even though Identity Guard focuses on helping protect your information from getting stolen in the first place, they still offer some identity recovery services. Their services include helping you cancel credit cards and replacing IDs if your wallet is stolen, which many other identity theft companies won’t do. Dedicated recovery assistants are standing by to help you get your identity back. Not only can they provide you with up to $2,000 in emergency cash, they can also provide you with $2,000 a week for up to five weeks, in addition to providing you with travel expenses and money for child care with their $1 million insurance policy. Identity theft companies start to sound the same after a while, but there are a few details that make Identity Guard stand above the rest. One of the biggest differences it that they offer a $1 million insurance policy with all of their adult plans. Although this may not sound different from the $1 million guarantees that other companies offer, there are some big differences. A guarantee assures you that the company will spend up to $1 million to get your identity back. Identity Guard’s policy doesn’t work that way. Instead, it functions like a true insurance policy, which means they will provide you with emergency cash, lost wages, and more. Because so many transactions take place online, it is vital that you protect your computer from criminals. Even though other companies don’t offer software with their policies, Identity Guard does. Their more comprehensive policies include computer protection, keyboard encryption, and password protection software. Although Identity Guard offers a few things many others don’t, there are some features that come standard with other plans that can’t be found in Identity Guard’s arsenal of services. Because they focus on protecting your identity, there aren’t as many services available if your identity is actually stolen. In addition to offering an insurance policy, instead of a guarantee, they do not set fraud alerts with the credit bureaus if your information has been compromised. While Identity Guard offers great customer support, their general customer service hours are Mon-Sat. Although, their dedicated case managers (which are provided to our customers if there’s ever any sign that their ID has been compromised) are available 24/7. Cost is always important to consider. Because Identity Guard offers two distinct plans, you can pay for the services you need without overpaying for the services you don’t. When you click our “Visit Site” button, you can view their lowest-price plan at just $8.99 and increases to $16.99 for a higher-end plan. If you’re assessing other identity theft protection companies, be sure you compare the list of features offered. Some offer more or less; you get what you pay for. If you’re looking for an identity theft protection agency that works hard to protect your identity and keeps you informed regarding your credit scores*, then Identity Guard is the right company for you. They are an especially good choice if you prefer a $1 million insurance policy to a $1 million guarantee. *The scores you receive with Identity Guard are provided for educational purposes to help you understand your credit. They are calculated using the information contained in your Equifax, Experian, and TransUnion credit files. Lenders may use many different credit scoring systems, and the scores you receive with Identity Guard are not the same scores used by lenders to evaluate your credit. Get the VALUE plan (individual) for $7.20/mo.